LONG ISLAND CITY — Take the edge off while you take a little off the top. Popular barber shop Otis & Finn has opened its second location in the neighborhood, where it will continue its tradition of offering customers a complimentary shot of bourbon to go along with their haircuts, beard trims and straight-razor shaves. The new shop debuted last week at 11-11 44th Rd. and is more than double the size of Otis & Finn's original location in Court Square, which has seen massive growth in its clientele since it launched two years ago, according to Shawn Dixon, who co-owns the shop with barber Kirk Riley. "The area's seen so much growth, and so has the barber shop," Dixon said. "The barber shop started booking up to the point that I felt like pretty soon we were going to be at capacity." 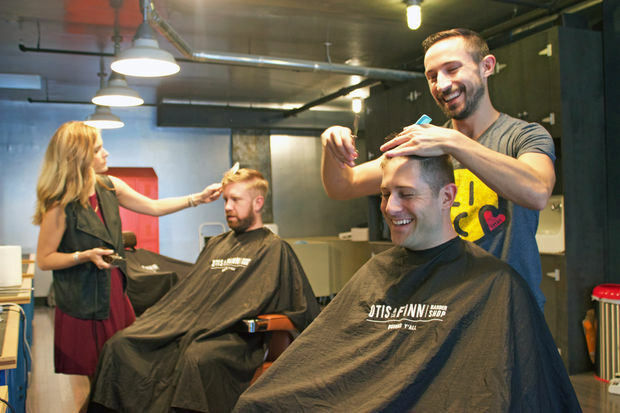 The new location will offer the same services as the first, including haircuts that come with a hot lather, straight-razor neck shave for $35, and each cut is finished with a relaxing hot towel. The shop also does shape-ups, fades, beard trims, shaves and buzz cuts ranging from $15 to $30, according to Dixon, who called it "very much a classic barber shop" that prides itself on attention to detail and not rushing its customers out. As a Kentucky native, it was his idea to offer clients a shot of neat bourbon with each visit — a touch of hospitality as well as a way to help customers unwind, Dixon said. "It's more about having the space for people to sit around and talk, catch up, meet each other, that sort of thing," Dixon said. "And if bourbon helps people do that, all the better." Otis & Finn opened its first location at 45-22 Pearson St. in the fall of 2014, looking to fill a need in the neighborhood, where local retail offerings have been slow to catch up with the booming residential population. Dixon and Riley, who both live in Astoria, said their friends living in Court Square were going into Manhattan to get haircuts and other services. "If you're living in a high-rise and there are no retail spots on the ground for people to get together, talk and all that sort of thing, then it sort of doesn't feel like a community, and like home," Dixon said. "We wanted to help build that sort of base." The new Otis & Finn on 44th Road will be expanding its hours in the coming weeks, but is currently open from 3 to 8 p.m. from Tuesday to Thursday and 10 a.m. to 8 p.m. on Fridays and Saturdays.